Gearbox Boss Says id, Crytek are "Risking Failure"
Gearbox Software boss Randy Pitchford is at it again, this time saying that Crytek and id are "risking failure" by developing games requiring highly advanced, cutting-edge hardware instead of focusing squarely on the current generation. Randy Pitchford's been making a lot of noise about other people's studios lately. It seemed initially that he just had a bee in his bonnet for Valve, accusing the Bellevue boys first of putting the screws to the rest of the industry with Steam and then later of being anti-PS3 fanboys because of their refusal to develop for the platform. But he spread it around a bit in a recent outburst in Official Xbox Magazine, turning his attention to a pair of other shooter developers, Crytek and id. Pitchford believes the two companies are setting themselves up for a fall by assuming that the current generation of consoles is going to last roughly as long as those of the past. "Anyone that built their strategies around the last generation timing, and is trying to employ those strategies today, is either being forced to adapt very quickly or is risking failure. This is going to be the longest generation we've seen in the last few of them," he said. "Some people have invested a lot going to a place that's too far, and the customers aren't ready for that yet because they don't have the hardware for it," he continued. 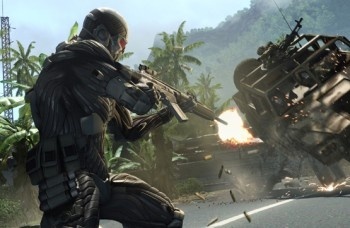 "I was thinking of Crytek, they couldn't find a market because they made a game [Crysis] that very few people could play. I'm not putting words in their mouth, I remember reading something publicly where they said they couldn't put this on consoles because of the hardware..."
id Software is making a similar mistake with Rage, he added. "We see the id guys talking continuously about this [with Rage], 'Well, Sony will have a Blu-Ray and I don't know what we'll do on the 360, maybe we'll have three DVD's... if the publisher will let us do that, maybe we'll errrrahh I dunno'," Pitchford said. "Because they're in this kind of 'generation plus' mode, and like nobody knows what the generation beyond this one is going to look like." Pitchford could have a point, I suppose, but I'm inclined to think that it's just more noise from someone who clearly craves attention. Both id and Crytek have reputations for developing cutting-edge games that are more remarkable for their technology than their actual gameplay, yet both companies have done quite well for themselves, particularly id, which has been advancing FPS technology since the early 90s. His suggestion that Crytek "couldn't find a market" for Crysis is equally fallacious: The game sold over a million copies, no small feat for a PC-exclusive FPS based on a new IP and, perhaps even more to the point, roughly in line with sales of the PC version of BioShock.